CHICAGO — Three years to the day since workers at the downtown Congress Hotel went on strike, the strikers and their union, Unite Here Local 1, joined leaders of the city’s religious, labor and community groups for a funeral-themed rally. 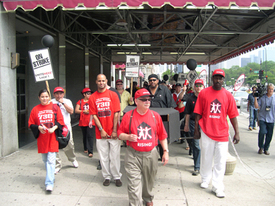 The June 15 “funeral” was held to mourn the loss of quality at what was once a world-class hotel, quality that has plummeted since management attacked the union, workers said. About 130 workers walked off the job in June 2003 when the hotel unilaterally imposed a 7 percent wage cut, eliminated family health insurance and pension benefits, and threatened to outsource union jobs. At the rally, members of United Food and Commercial Workers, Service Employees, Teamsters, United Steelworkers, United Electrical Workers and Jobs with Justice — all wearing matching union-made T-shirts — marched in the picket line in a colorful display of solidarity with the strikers. The union estimates the hotel could have made at least $70 million more in revenue if it had been operating at average downtown occupancy and room rate levels over the past three years. “We are struggling for equality and for a better future for our children,” said Delores Contreras, who worked at the Congress Hotel for three years, and now works at the Radisson Hotel. According to leaders in the hospitality industry, the hotel is an embarrassment that undermines proper standards. Hundreds of customers have reportedly complained about poor service and unsafe, unsanitary conditions since workers walked off the job in June 2003. 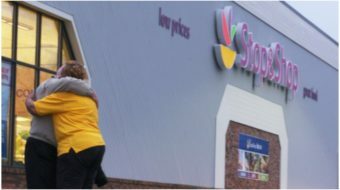 Some customers even admitted that if they had been informed about the strike they would not have booked rooms at a struck hotel. “We are workers, and we only ask for justice,” she said. Another worker, Gus Greer, an African American who worked at the hotel for 35 years, told this reporter that when he heard about the strike he walked out and has not looked back since. Currently he works as a bus driver and is not sure if he would return to his former banquet and bartending duties if a contract is won. Nevertheless, three years later, Greer says he continues to join the picket line, putting in at least 15 hours every week.